SOCHI, Russia (Reuters) - Russian President Vladimir Putin said on Thursday that Japanese Prime Minister Shinzo Abe told him Tokyo could not immediately sign a peace treaty with Moscow without first resolving their territorial dispute. Putin, sitting alongside Abe at an economic forum in Vladivostok last month, proposed Japan and Russia conclude an unconditional peace treaty that would formally end World War Two hostilities between the two countries. Russia and Japan have been in dispute for seven decades over island territories captured by Soviet troops in the last days of the war. As a result, they have still not formally ended hostilities. 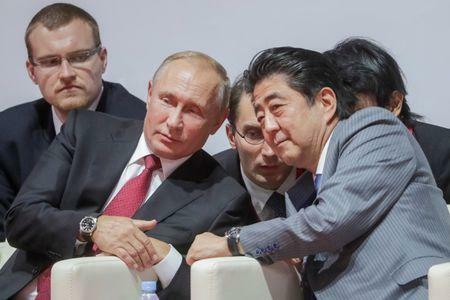 Putin said he had discussed his proposal with Abe and that the Japanese prime minister had called the approach "unacceptable", adding "that we must first work out a principled decision on the territorial issues, and only then talk about a peace treaty." Speaking at a forum in the Black Sea city of Sochi, Putin said Russia was still ready to work on finding a solution, but that trust-building was needed for a peace deal and that Japanese sanctions on Russia were not fostering trust.